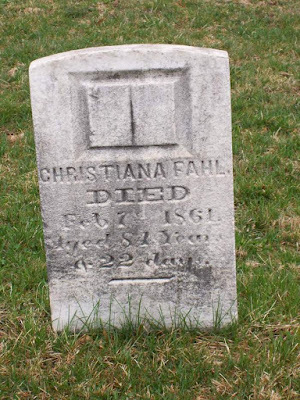 Gravestone of Christiana Fahl found through "FindAGrave" at Beavertown Cemetery, Beavertown, Snyder Co, PA. According to the gravestone she was born around Jan 16, 1777 and died Feb 7, 1861. She was 84 years and 22 days old. Other Falls found using "FindAGrave" in the Beavertown Cemetery were Samuel Fall and Cora Fall. Could Christiana Fahl and Christena Falls be the same person. It is possible, since consistent spelling of names was hit or miss. As far as ages, according to Christiana's gravestone in 1861 when she died she was 84 years old. Her approximate birth date would have been 1877. On the 1860 Census, Christena's age was indicated at 75, giving her a possible birth date around 1885. Neither the differences in names or age preclude them from being the same person, but more information is needed to know either way.